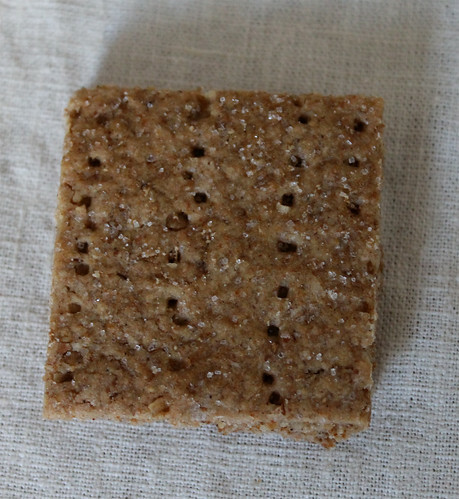 There are a number of ingredients to assemble for the graham crackers, as I explained in my previous post on graham crackers, but it's well worth it if you take the time to get the right ingredients. 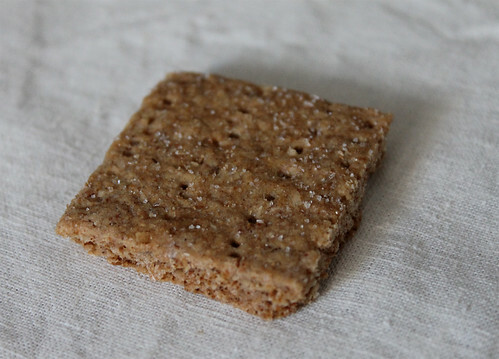 The graham flour is crucial to getting that textural quality that makes a graham cracker what is is. And while I have substitute whole wheat cake flour for the oat flour, you won't get that same sweetness as you would get with the oats. These can be made plain, but I like to take them up a notch by adding some spices. I've done cinnamon-flavoured graham crackers before, while these spiced ones with cinnamon, ginger, cloves and cardamom are perfect for the holidays. 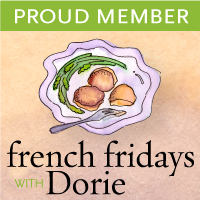 Pair these with my Chocolate-Dipped Vanilla Bean Marshmallows, pop them under the broiler for a few minutes and you instantly have some delicious s'mores! In a food processor, combine the flours, wheat germ, wheat bran, 1/4 cup sugar, salt, baking powder, baking soda, and spices. Pulse to mix thoroughly. Sprinkle the butter cubes over the flour mixture. Pulse until the mixture resembles cornmeal. In a small cup, stir the milk, honey, and vanilla together until the honey is dissolved. Drizzle the honey mixture into the bowl. Process just until the mixture gathers into a single mass. Shape the dough into a flat 8- or 9-inch-square patty. Wrap and refrigerate it until very firm but supple enough to roll out, 20 to 30 minutes. Or keep it refrigerated for up to 2 days and then let soften slightly at room temperature before rolling. Preheat the oven to 350˚F. Position a rack in the center of the oven. Roll the dough between the sheets of parchment paper until it is about 1/8-inch thick and as even as possible from the center to the edges. Flip the paper and dough over once or twice to check for deep wrinkles; if necessary, peel the parchment and smooth it over the dough before continuing. Peel off the top sheet of parchment. Sprinkle the dough evenly with 2 or 3 teaspoons sugar. Prick the dough all over with a fork. Slide the dough (and remaining sheet of paper) onto the pan. With a sharp knife, even up the edges of the dough and score it into squares, rectangles, diamonds, or rhomboids as you like. Leave edge scrapes in place (for good nibbling and to protect the rest of the grahams from burnt edges). Bake for 20 to 25 minutes, until the grahams are golden brown with deep brown edges. Rotate the pan from front to back halfway through the baking time to ensure even baking. Set the pan on a rack to cool. Break the grahams along the score lines. Cool the grahams completely before storing. May be kept in an airtight container for at least 3 weeks. Ally December 21, 2011 at 9:25 a.m. These look great - much better than the store bought versions! I feel a bit intimidated to make crackers though...is it relatively painless?